You are patriotic soldier with the invincible shooting skills, who wants to save his country from the ferocious enemies and their dangerous plans. With your surveillance helicopter, you are in the enemy zone so that you can get the information about your enemy’s intentions. You are going to experience the most different and terrific action packed shooting stunt game that will challenge your gaming and shooting training skills. 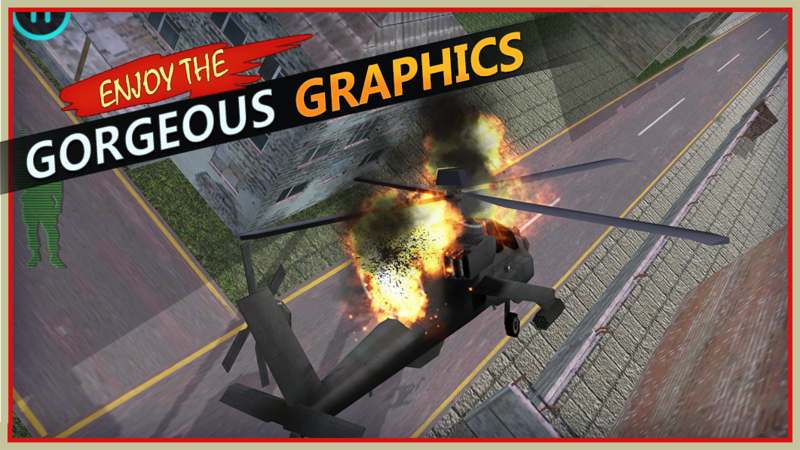 All the action and thrill gaming maniacs, this game takes you to most realistic battlefield that you have never seen before! You are patriotic soldier with the invincible shooting skills, who wants to save his country from the ferocious enemies and their dangerous plans. With your surveillance helicopter, you are in the enemy zone so that you can get the information about your enemy’s intentions. Here comes the Bad news! Your helicopter is targeted by the enemy base and got down immediately. Your soldiers and companions are not alive and your helicopter is crashed. You are lone survivor with weapons like AK47 and you must save your life from the enemy attack from all over the field. This is your battlefield and as one-man- army, you have to hit the targeted enemy soldiers. This game presents the excellent and most realistic warzone aura, with all the action and thrill, that you always wanted! The army sniper shooting game 2017 is embellished with the awesome sound effects and cutting edge 3D graphics. This is army commando shooting game starts with the barren fields where you find the enemies hide in the corners and road sides, so you have to be very careful because they can attack you at any time. You have to tackle your enemy attack with full courage and determination, this is survivalist war where you have to find the life. You are the best soldier with the best shooting skills whose target can never be missed, so defeat your enemy and be the ultimate army commando shooter 2017. This is best shooting game 2017, that provides you with the challenging levels accompanied with unimaginable obstacles and maximum stunts 2017. So, you must complete each level in the specified time, otherwise you will lose the level and start again. Be the military commando shooter and uncover your invincible shooting to your enemies. You are provided with advance ammunition store where you find the weapon of your choice like rifles, shotguns, armor, sniper guns and rifles, machine guns and many more! This is best chance for the adventure and gaming fanatics to explore the lifetime experience.